Khalighi-Sigaroodi*, F., Mirzakhanlouei, S., Ghafarzadegan, R., Hajiaghaee, R., Mohammadnezhad, A. (2017). Encapsulation of thyme essential oil in polymeric capsules using electrospray method. 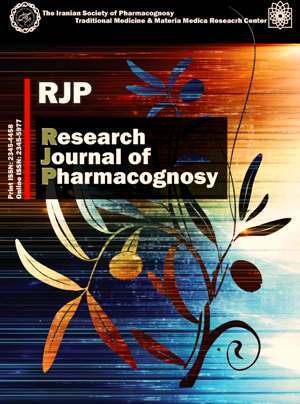 Research Journal of Pharmacognosy, 4(Supplement), 28-28. F. Khalighi-Sigaroodi*; S. Mirzakhanlouei; R. Ghafarzadegan; R. Hajiaghaee; A. Mohammadnezhad. "Encapsulation of thyme essential oil in polymeric capsules using electrospray method". Research Journal of Pharmacognosy, 4, Supplement, 2017, 28-28. Khalighi-Sigaroodi*, F., Mirzakhanlouei, S., Ghafarzadegan, R., Hajiaghaee, R., Mohammadnezhad, A. (2017). 'Encapsulation of thyme essential oil in polymeric capsules using electrospray method', Research Journal of Pharmacognosy, 4(Supplement), pp. 28-28. Khalighi-Sigaroodi*, F., Mirzakhanlouei, S., Ghafarzadegan, R., Hajiaghaee, R., Mohammadnezhad, A. Encapsulation of thyme essential oil in polymeric capsules using electrospray method. Research Journal of Pharmacognosy, 2017; 4(Supplement): 28-28. 1Medicinal Plants Research Center, Institute of Medicinal Plants, ACECR, Karaj, Iran. Background and objectives: Essential oils (EOs) of medicinal herbs are prone to degradation by oxidation, heating, or light. Encapsulation of EOs can protect these fragile volatile natural products from degradation. Thymus vulgaris (thyme) is a well-known herb which has been used as food additive as well as medicine since ancient times. Electrospraying is a novel technology to encapsulate food and pharmaceutical materials. The aim of this study was to apply electrospray method for encapsulation of thyme essential oil in polymeric capsules. Methods: The thyme essential oil was obtained by hydrodistillation. Ploylactic acid (PLA) capsules, loaded by thyme EO, were synthesized by electrospraying. The applied voltage was set at 18 kV and the flow rate of solution in injector was 0.5 mL/h. Polymethyl methacrylate (PMMA) capsules were also prepared. The distance between metal nozzle and collector plate was 25 cm. The solution was injected at the flow rate of 0.5 mL/h and the applied voltage was set at 8 kV. SEM micrographs of the produced micro/nanocapsules were analyzed using image j software. Results: The findings indicated that the mean diameter of PLA capsules were about 162 nm while in the case of PMMA capsules, the mean diameter of fabricated particles was about 5.4 µm. Conclusion: The major conclusion of this study was that the particle size and morphology of synthesized particle was directly affected by the type of polymer utilized for electrospraying.